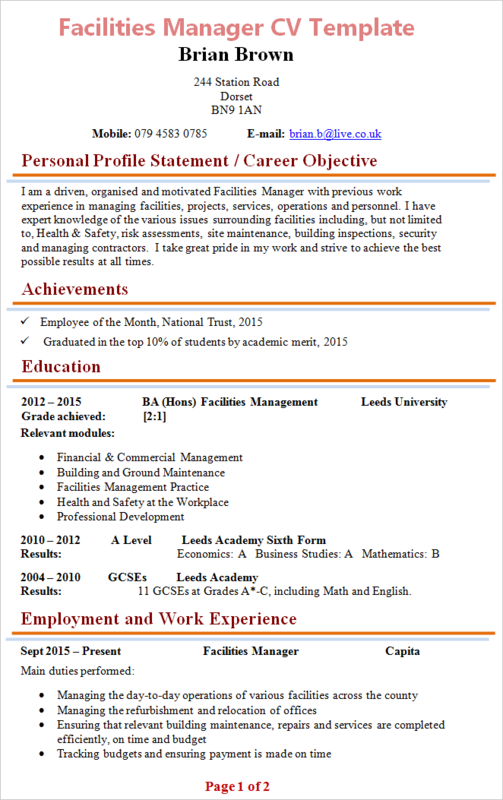 Tip: Use the Facilities Manager CV Template below as an example to help you write your own personal and fully-tailored CV. I am a driven, organised and motivated Facilities Manager with previous work experience in managing facilities, projects, services, operations and personnel. I have expert knowledge of the various issues surrounding facilities including, but not limited to, Health & Safety, risk assessments, site maintenance, building inspections, security and managing contractors. I take great pride in my work and strive to achieve the best possible results at all times. Staff management: responsible for 50+ staff including site managers, contractors, builders, cleaners, catering and administrative staff. I am an active member of my local football team, and I have recently been selected as the captain of the team. Not only does this hobby keep me fit and active but it also helps develop my team-working skills outside of my normal working environment. People skills: As a Facilities Manager you will be working with a variety of people on a daily basis including facilities and administrative staff, third-party contractors, temporary staff, security personnel, etc. Your key responsibility is to manage people and services in order to achieve certain objectives and you will not be able to do this unless you have good people skills. It is, therefore, recommended that you allocate a big part of your CV to your social, interpersonal, persuasion, communication, team-working and management skills by giving real-world examples. Translating the vision and values of the organisation into day-to-day activities .